Yesterday, I posted about our thinking and loneliness. Go back and read that here: I don’t have any friends Today, it’s about FEELING lonely. While the emotions we experience aren’t entirely our FAULT we are absolutely responsible with what we choose to do with them. Antonio R. Damasio*, a noted neurologist taught the differences between an emotion and a feeling. The emotion was something our body creates on a cellular level. The body reacts to stimuli and creates this emotion. It’s automatic to your body and unconscious. Science now tells us there are only 6 basic/core emotions*: Anger, disgust, fear, happiness, sadness, and surprise. This is why sometimes you just feel your heart racing, your muscles contracting – you’re generating fear. The body then sends signals to the brain to interpret these emotions – THEN they become feelings – what WE CHOOSE to interpret them as – what we CHOOSE to do with that emotion. It is possible to have fear as an emotion, have it register in the brain, and then YOU CHOOSE to act anyway. You can override your primitive emotions to create the FEELINGS you want. Sometimes that emotion will sit there, very persistently and that’s oaky. It’s your body just trying to protect itself from the unknown. BUT if you know you’re going to be okay. That you can feel fear and go forward anyway that emotion will dissipate and leave eventually. It’s only when that emotion sends those signals to your brain and you start adding to it creating a strong feeling that it could become a problem for you. When it’s Friday night and everyone has somewhere to go but you. Your body might start an emotion as sadness or fear – a subtle emotion – a chemical reaction in your body – that it’s missing out on something. It doesn’t know what – that’s your brains job to interpret it and decide if this is danger or not. There might be danger. So it sends that signal to the brain. Brain, how should we interpret this? What is going on? Then you think thoughts to sort out why you’re feeling the way you’re feeling. This is where it could become an issue for you. You think, I’m feeling this way because no one invited me to hang out with them. You think, I don’t have any one to call and chat with. No one wants to have me around. I’m different. I don’t fit in. This stinks. I hate feeling this way. Now your brain has created a full blown feeling of loneliness…and it doesn’t feel good. It’s not supposed to. 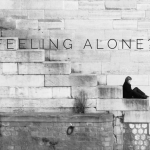 Feeling friendless, feeling lonely, is strong and can be terrible and debilitating at times. We think we’re at the whim of the of our emotions. That we’re constantly in reaction mode because of how our body chooses to feel from one moment to the next but that’s not the case. We get to interpret how our body is reacting to chemicals in our body – we ultimately get to choose how we’re going to FEEL (our feelings – different than emotions) and what we’re going to do with that information. We are responsible for our feelings. 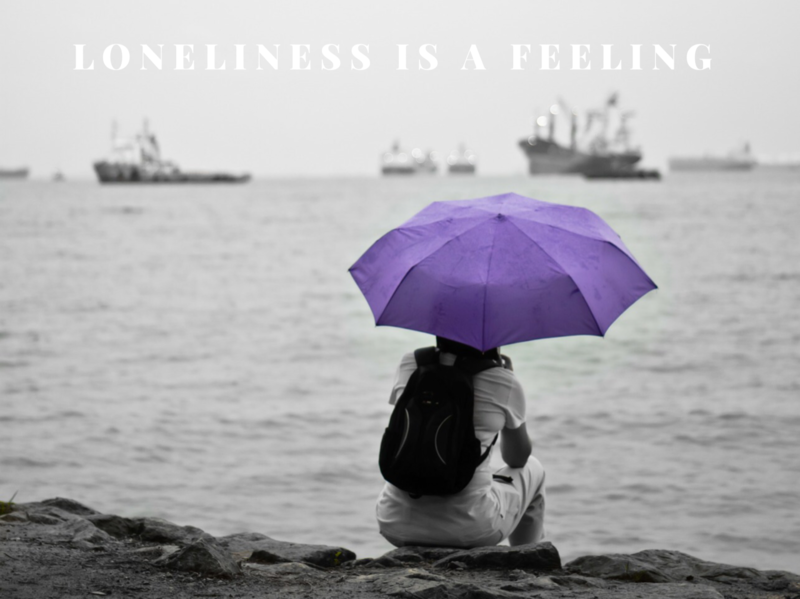 Loneliness can stem from sadness or fear but how are you going to choose to interpret it? The first thing you need to do is describe it. What are you feeling? What does that feel like? Second, label it/name it: What am I feeling specifically? Third, take responsibility for it: Am I contributing to this emotion by my thoughts? Am I generating this strong feeling? Fourth: What do you want to do about it? Do you want to feel this way? Is this what you want? – Now I’m not saying that you need to RESIST it. This is when you feel sad. You don’t want to feel sad so you instead tell yourself you’re really happy instead – your brain already knows that’s a huge lie and will reject it. 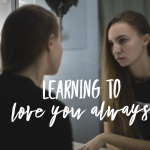 Then you’ve got this battling feeling inside you because not only are you still experiencing sadness, now you’re also feeling frustration because you can lie to your body and tell it something that isn’t true. You have to ALLOW it to be there. You can work towards what you want while experiencing what you’re feeling now. Let the sadness stay for a little bit. Tell yourself, I feel a little sad, and that’s okay. Be willing to be sad, to be uncomfortable, to be lonely at times. Just let is stay. The key is NOT TO ADD MEANING or CONTRIBUTE to it. Don’t add thoughts of woe to it this will intensify the feeling and create a full on attack (so to speak). Allow it to stay without contributing to it. Just tell yourself, I’m feeling _____________. I’m feeling ____________ and it’s okay. I’m feeling lonely. I’m feeling lonely right now and that’s okay. I’m feeling sadness. It’s just sadness. It’s okay. You can let it stay. Acknowledge it. Define it. Then decide what to do with it. We’re supposed to experience these things. When you go to an event and everyone there is laughing and chatting with each other and you’re not being included – are you supposed to be happy about it? Would you want to? No. Our bodies will generate that emotion that something is wrong. Your brain will get to decide what to do with it. I’m feeling alone. I’m feeling left out. I’m feeling scarcity. WHAT DO I WANT TO DO WITH IT? I can ADD to it: See, I’m different. No one likes me. If they did I’d be included. No one even thought to invite me, etc. This will for sure ADD to it and you’ll feel very, very lonely. This also leaves you stuck. You’re not going to want to jump into someone else’s conversation or do anything. You’re going to want to leave, sit by yourself, be alone in your loneliness. OR you can let it stay and choose to act instead. I’m feeling a weight at the pit of my stomach. There’s a strange feeling in my throat, I feel sad. I feel lonely. What am I going to do about it? Thought interpretation time: Instead of, they didn’t think to include me – maybe they’re just distracted and are assuming I’ll jump in when I can? Maybe they think you’re already super confident and you’ll join in whenever you want. It doesn’t matter what they think – just what you think. You think you want to be a part of that group? Let the emotion stay and do it anyway. Go stand next to the group and become a part of it. You don’t even have to go that far if you don’t want to. You can think productive and validating thoughts in your own head and still be okay. If you’re at home alone and feeling sad – don’t add to it with all the ways you’re different creating loneliness. Do something – call someone. If you can’t call someone – make something, read a book, watch a movie, serve someone, write – start a thought download – write a gratitude list (this is so helpful -especially doing it when you least want to – you’ll be amazed at how your mood shifts when you focus on all the abundance in your life). Decide that you’re not going to let this emotion over power you. You do have control over what you decide to do and who you decide to be. You get to decide what will help you through it. You get to decided what to do when those emotions come – remember feeling lonely is a FEELING – NOT a circumstance. You create that feeling by your thoughts. It may start as a sadness – one of the core emotions that your body produces- a chemical reaction/feeling/vibration in your body* -that’s it. Then you escalate it into something else based on your interpretation of it. How are you going to THINK about it? When you can allow the emotion to stay – while still deciding what you want it creates growth/movement/progression. Growth that you can do anything you want to do. You never have to be stuck in the emotion, doing nothing, not progressing. You can feel that way and still move forward. You are in control of you. You are the agent to act not to be acted upon, as David A. Bednar would say. This is great news. It’s not an affliction. It’s a circumstance. The emotions your body generates is a circumstance. It is out of your control. Now what thoughts are you going to have about it? What FEELINGS are you going to create because of it? How are you going to show up in the world? Are you going to continue in growth despite the circumstances? Or are you going to remain stuck? Either way, it’s up to you. You get to navigate your life. Use these tools to help you next time you’re feeling loneliness. It is a feeling. It’s a product of your thoughts. You can let it stay while working through it to get what you want. I’ll dive much deeper into emotions vs feelings in a later post – but for now, you can absolutely let the emotion stay and keep living how you want to.